Kang and I were buds since Sec 1 and being neighbours, we were going to school and back together everyday. The year was 1986 and we were both in Sec 3. We would wait for each other at East Sussex bus stop every morning and we would alternate our 2 routes to school with each semester. Bus No. 200 or 5 to go down Sixth Avenue where we would change bus at Dunearn Road to take either 170, 171, 172, 175, 180 or 182. The "scenery" would include girls from Whitley, Swiss Cottage, RGS, SCGS, NanYang, MGS, Monk's Hill, St Margaret, just to name a few(!). Bus No. 7 down Holland Road, where we would alight at Specialists' Centre to take CSS No.3. Scenery was lesser in variety but higher in concentration of the SCGS, MGS and RGS pedigrees. Yes, we were very much enslaved by our own adolescent hormones back then. Then there was this one day when we were about to embark on another Route #1 when Kang decided not to take the 200. He said that he needed to take the 165 to Clementi instead, which by the way, was totally illogical as it was the opposite direction to school. I didn't put much thought into it initially until curiosity got the better of me after two weeks of traveling to school alone. I met Kang at East Sussex bus stop as usual and we both boarded the 165. We got off at Clementi and took another bus across the street and got off at the far end of Dunearn Road where Yeo Hiap Seng bottling plant used to be. It was there, where all was revealed. Kang was smitten with this Swiss Cottage girl whom he had gotten to know recently. LM was her name and Swiss Cottage, being a bus stop before ours, meant that Kang had the whole stretch of Dunearn Road to be with her. I could see that she was enjoying the company but warned Kang that he wasn't going to get anywhere with her. She was leading him on. Alas, 当局者迷，旁观者清, he wouldn't hear any of it and I went back to going to school via my usual routes. Things gotten worse for Kang as another guy from our school, showed up regularly at the Yeo Hiap Seng bus stop, doing the exact thing that Kang was doing. Alan, too, was bitten by the LM bug and the damsel then found herself with 2 escorts to go to school each morning. As luck would have it in all Taiwanese soaps, Alan and Kang were classmates and both fell out with each other, turning their friendship into rivalry. 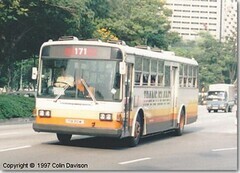 After countless bus rides, coupled with the showers of little gifts and cards, both bit the dust at the end of it all. I knew about the gifts as I was always the guy to lend money to Kang to tide over the rest of the month. Hitomi: This is the LM that I mentioned from SAJC. I bumped into her a couple of years later at Shaw Towers Burger King when we were in JC and again in Canteen A, when we were in NTU. What happened in between will be another story, another time, if at all. did your 2 friends make up? yes, we'll be waiting for the story. Zhe Bin: They never made up coz after O-levels, they went their separate ways and had lose contact since. Big brother? I guessed so in this case but not everytime I tai kor one lah. There are other friends who were big brother to me too. hey man...was reading your last post. Eh your wife doesn't read your blog? Won't she get insanely jealous when she reads it? ahdokboy: Good to see you back online again. I am not sure if she reads my blog. I seriously doubt so as blog is not really her thing. 1) The events were before her time. 2) She probably knew about them already. 3) Would she rather I lie about it? Akk: Yah.... 2 of them somemore. Was LM from SAJC Commerce? Need to refer to yearbook to see how she looks like. hitomi: I think so but she is 2 years older than you. Can still locate meh? my sis, who is your age, also went SAJC. think she has the year book too. hitomi: Bribe you? Easy peasy.